Prosecutor General Yury Chaika has said that Russia does not plan to accede to Ukraine’s requests to extradite ex-President Viktor Yanukovich, as it sees political motives behind the criminal case against him. “We will surely answer the request by our colleagues from the Ukrainian Prosecutor General’s Office, and our answer will be negative as we see political motives behind this criminal prosecution,” Interfax quoted Chaika as saying on Tuesday. He stated that such a handover is forbidden both by the Russian law and international legal norms. The Russian official noted that the same principle would apply to Yanukovich’s political allies who currently reside in the Russian Federation. In December last year, Ukrainian Prosecutor General Vitaly Yaryoma accused Russian law enforcers of ignoring extradition requests concerning former Ukrainian officials who had fled to Russia. He claims there are 22 of them. In mid-January Chaika commented on this claim, saying that Russia had not received any official requests from the Ukrainian authorities concerning Yanukovich and adding that if such documents were to appear the reaction would be in line with Russian and international law. The new Ukrainian authorities have initiated about 30 criminal cases against the country’s former president and impounded property that belonged to Yanukovich, his allies or companies allegedly connected with certain former officials. 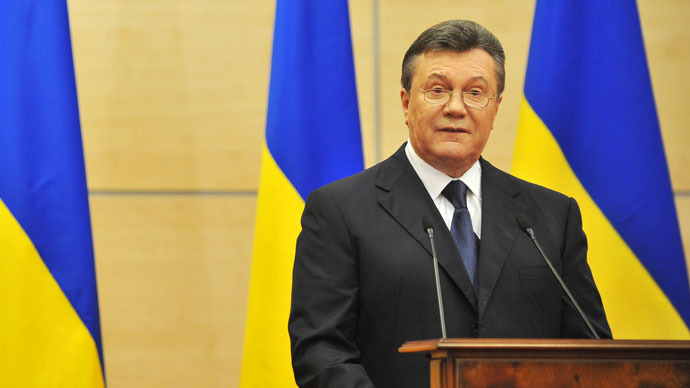 In mid-January Yanukovich was put on the Interpol wanted list. Charges against the former official include misuse and embezzlement of state property.